Just one of the many 4th of July themed treats available at Manhattan Beach Creamery. Downtown Manhattan Beach is a great place to be for the 4th of July! While we don't do fireworks (we save our big event for a Sunday in early December), merchants are ready to help you entertain in style, hang at the beach, or eat some great food! 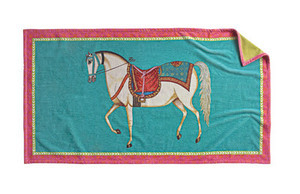 Beach towels are on sale til 2 p.m. July 4th at Tabula Rasa Essentials. For starters, Tabula Rasa Essentials is offering 15% off all beach towels, beach totes, and plastic beach cups on Saturday, July 4th only when the shop is open from 10 a.m. to 2 p.m.
Bella Beach and Bella Beach Kids are open today (July 4th) from 10 a.m. to 4 p.m., offering 20% off on USA hoodies, shorts, flag scarves, and American flag backpacks and totes. Margaret O'Leary is open normal business hours all weekend and is offering 40% off the entire Spring collection. Yorktown, one of downtown MB's newest shops, actually has direct ties to our nation's Independence: The final land battle of the American Revolution was at Yorktown, VA, in 1781. Lieutenant General Cornwallis surrendered to General George Washington, prompting England to sign a treaty granting indenpence to the USA, notes Yorktown MB Owner Maureen McBride. Read More About the Seige of Yorktown compliments of Yorktown MB. Darren's Restaurant is open for brunch today and Sunday, July 5, and The Rockefeller Gastropub is offering $4 mimosas each for brunch today (July 4th). Bonaventura Gelato Lounge is open until 12 midnight today (July 4th) so you can close out those fireworks parties with something sweet! Manhattan Beach Yacht Club Now A Destination for Grilled Cheese Creations. Blvd., which is closed for the 4th of July, will re-open on Sunday, July 5 at 11 a.m.